The time has come for us to come together and elevate the vibration of our world to a more loving and peaceful one. 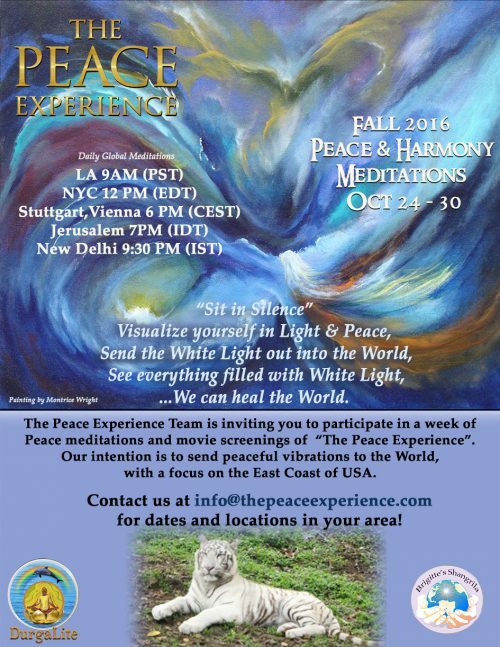 You are cordially invited to join us remotely for daily meditations during the week of October 24th – 30th. You may join our groups around the globe via Skype at designated times (see the flyer), set-up your own personal meditation group, or simply meditate on your own anytime during this week. We start with a prayer followed by at least 15 minutes personal meditation. If you are new to meditation, you may review SRF guided meditation. For the next 15 minutes, we use the Peace and Harmony Prayer; we visualize peace and harmony vibration as a sphere of white light around each of our loved ones for 1 minute and ourselves for 15 seconds. For the next 15 minutes, we pray for World Peace by visualizing expanding white light emanating from our hearts through our bodies into our surroundings, cities, and countries, all around our Earth and solar system, and enveloping our galaxy and beyond. We close our meditation with a prayer. Overcome paranoia and fear with faith. Release supremacy and racism with brotherhood. Transform greed and poverty to abundance. Manifest World Peace in a united world. Please contact us if you have any questions or you are interested in a screening of The Peace Experience.